Adults who use libraries and visit library websites are often ahead of the crowd when it comes to being learners, engaging with information and embracing technology. Fully 97% of those who visited a library or bookmobile in the past 12 months say the assertion “I think of myself as a lifelong learner” applies to them “very well” or “somewhat well.” And 98% of those who have used a library website in the past year feel the same way. A recent Pew Research Center report about lifelong learning and technology found that 74% of adults participate in learning activities that make them “personal learners.” That is, they had done at least one of several activities, such as reading how-to materials or taken courses in pursuit of learning more about personal interests or hobbies in the past 12 months. 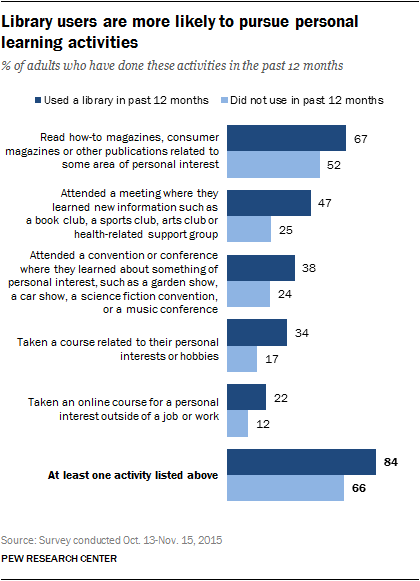 Some 23% of personal learners have pursued those interests at libraries in the past 12 months. The personal learners who are among the most likely to have used libraries for these kinds of enrichment activities include those in households earning less than $50,000 (29% of the personal learners have done so), those ages 65 and older (30% of this cohort have done so) and women (27% of the personal learners in this cohort have done so). In our earlier report, it was also noted that 63% of those who are working (either full time or part time) are “professional learners,”2 those who said in the past 12 months they had participated in job-related learning activities that either upgraded their skills or prepared them for new jobs. That amounts to 36% of the entire adult population. Some 9% of professional learners have pursued their classes or training at libraries. It is often the case that library users are more likely than others to pursue a variety of learning experiences in all kinds of venues and formats and to say they have reaped benefits from those learning activities. The rest of this chapter will provide the latest data about who uses libraries, library websites and library mobile apps and then will examine the ways in which library users – as learners – participate in learning activities and profit from them. This survey finds that 78% of adults have ever gone to a library, while 44% say they went to a library or bookmobile in the past 12 months. The findings indicate a downward drift in the number of those who use physical library buildings in any given year. In November 2012 when Pew Research Center began tracking library usage, 53% of adults said they had used a library or bookmobile in the past 12 months. And the numbers have moved lower since then. Fully 84% of those who visited a library in the past 12 months are personal learners, which compares with 66% of those who visited a library less recently or who have never been to a library. And 86% of those who visited a library website in the past year can be categorized as personal learners, compared with 69% of other adults. In addition to asking about use of the library buildings and library websites, we asked a separate and new question in this survey about use of library apps. While 12% of adults said they have used one at some point in their lives, some 9% said they have used a library app in the past 12 months. Overall, in the past 12 months, 50% of adults interacted with a library through its facility, website or app. When it comes to the demographic traits of library users, this survey’s findings parallel previous patterns the Center has documented. Those who have visited a library or bookmobile in the past 12 months are more likely to be women, parents of minor children and those with higher levels of education. Younger adults ages 18 to 29 are more likely than their elders to have used libraries during the previous year. And those less likely to have recently visited a library include Hispanics and those who live in rural areas. The same basic patterns hold for those who have used a library website in the past 12 months. When it comes to people’s use of mobile apps offered in connection with libraries, people’s level of education is the most noteworthy demographic difference tied to usage. Fully 79% of those who have used a library or bookmobile in the past 12 months say the statement “I think of myself as a lifelong learner” describes them “very well.” Another 18% say the statement describes them “somewhat well.” That compares with 69% of those who did not use a library in the past 12 months who think the label of lifelong learner apply “very well” to them. Similarly, library users are more likely than others to agree with the statements that 1) they like to gather as much information as they can when they come across something unfamiliar and 2) they often find themselves looking for new opportunities to grow as a person. Library users are also somewhat more likely to think that all people should be in a learning posture in at least some domains. For instance, those who have visited a library in the past 12 months are more likely than those who haven’t to think it is “very important” for people to make an effort to learn new things about their local community (73% vs. 68%) and to learn new things that are happening in society, such as developments in science, technology, entertainment or culture (74% vs. 65%). People who used a library or bookmobile in the past year are more likely than non-library users or less-recent users to be technology users. Internet – 93% of those who used a library or bookmobile in the past 12 months are internet users. Smartphones – 76% of those who used a library or bookmobile in the past 12 months are smartphone users. Home broadband – 74% of those who used a library or bookmobile in the past 12 months are home broadband users. Social media – 74% of those who used a library or bookmobile in the past 12 months are social media users. 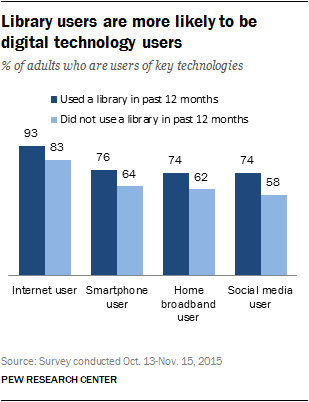 The same gaps in digital technology adoption appear between users and non-users when it comes to those who have used a library website or used a library app during that time period. The Center identified personal learners by asking questions about a variety of activities related to personal enrichment and pursuits and found that those who visited libraries or used library websites in the past year stand apart from others in each of the pursuits queried. The same patterns also apply when comparing those who have used public library websites or mobile apps in the past 12 months with those who have not. When it comes to where people pursue their personal interests, more recent library users are not only more likely to use libraries for personal learning, but they also are more likely to use several other locales. In the nearby chart, the only place where there is no statistically meaningful difference between those who have visited a library in the past 12 months and those who have not involves using the internet for personal learning. 84% of the personal learners who had visited a library or bookmobile in the past 12 months said they wanted to learn something that would make their life more interesting or full. 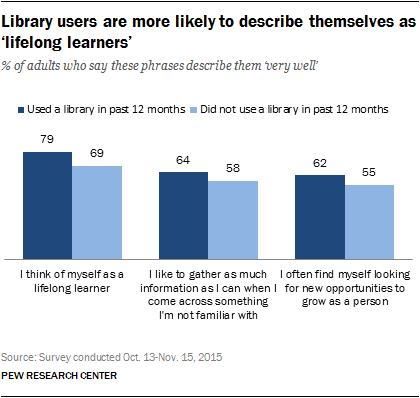 That compares with 76% of the personal learners who had not recently used a library who felt that way. 67% of the personal learners who had recently visited a library said they wanted to learn something that would allow them to help others more effectively. Some 60% of those who had not recently visited a library cited that as a motive. Recent library users did not show significant differences with others when it comes to other possible reasons for being a personal learner. Some 60% of all personal learners said they pursued these interests in the past 12 months because they had some extra time on their hands; 36% said they wanted to turn their hobby into something that generated income; and 33% said they wanted to learn things that would help them keep up with the schoolwork of their children, grandchildren or other kids in their lives. Asked about some potentially helpful or satisfying outcomes from the personal learning they had done in the past 12 months, those who had visited a library in the past 12 months were more likely to say their personal learning had a notable impact. 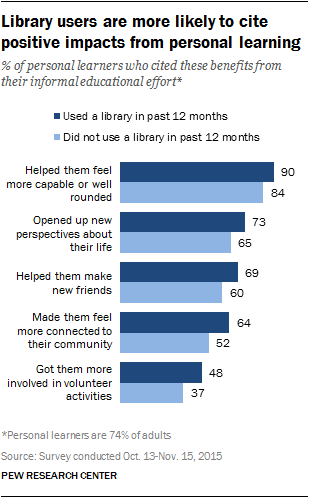 That means library users were more likely to say their personal learning experience helped them feel more capable; opened up new perspectives about their lives; helped them make new friends; made them feel more connected to their local community; and got them more involved in volunteer activities. The same patterns about impact also apply when comparing those who have used public library websites or mobile apps in the past 12 months with those who have not. The Center did not ask the kind of follow-up questions that could explain these differences. It is possible they arise from the fact that recent library users are somewhat more civically oriented than others. It also might stem from the fact that library users feel more enthusiastic about learning, as a rule. Those who had visited a library or bookmobile in the past 12 months were not significantly more likely than others to do any of the job-related learning or training activities. However, those who had used library websites in the past 12 months were more likely to have done them than others. This might be a consequence of workers being more likely than non-workers to be internet users and that the materials at libraries can be relatively reasonably accessible via the library website. As noted above, 13% of professional learners got their training or pursued their skills development at a library. The one statistically significant difference on this issue involved Hispanic professional learners. Some 16% of Hispanic professional learners got some work-related training at a library, compared with 8% of whites and 9% of blacks who are professional learners. Otherwise, there were no notable demographic distinctions among those who did their job-related learning at the library. Expanded their professional network: 69% of the professional learners who also were recent library users said their job-related learning expanded their professional network. That compares with 62% of others who said they got this benefit. Helped them advance within their current company or organization: 52% of the professional learners who had recently used the library say their job-related learning helped them advance with their current employer. That compares with 43% of the professional learners who not recent library users. There were no differences among the professional learners who were also recent library users when it came to two other possible impacts of their new learning: 1) enabling them to find a new job inside or outside their current organization (29% of all professional learners got that benefit) and 2) helping them consider a different career path (27% of all professional learners got that benefit).